Wake me up when Dispossessed get updated. Maybe the Tomb Kings can be brought back as an Idoneth endless spell. 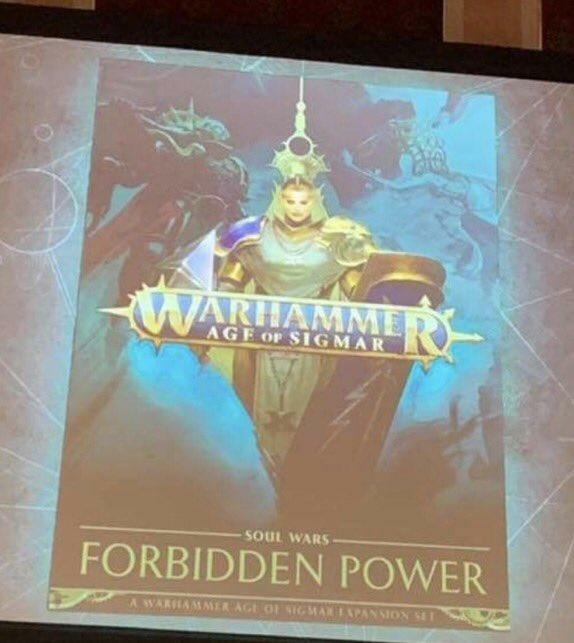 Wait, is that Celestant-Prime in AOH armour color vs Lady Olynder? and I really want Celestant-Prime to smite that vicious dead traitor scum severely. To be honest, Nagash should learn to choose some better and more reliable undead-thing as Mortarch. No, no, no. It totally is THE RETURN. We're getting Tomb King Stormcasts. Fact: GW always has Stormcasts in their boxes with new models. We can say that GW wants the Stormcast to RULE. Fact: The teaser art shows a half Stormcast. half Undead face. That 99.99% confirms a unit with links to Order and Death. Fact: The tomb in the teaser video has kinda egyptian mottifs. It's a TOMB! And who better to RULE than a KING? Fact! : I really want Egyptian Stormcast. Any other conclusion is whislisting, These are the facts. Not to get bogged down in semantics (he said, as he bogged down with semantics), if you changed your post from "always" to "often", it becomes objectively true. Actually, that could make for some cool conversions. they were discontinued for 2 reasons. @Joseph Mackay currently in AoS there is pretty much nothing GW can copyright in terms of model design. Daughters of Khaine are running around with medusa and harpies; dwarves are rampant with airships; heck Nighthaunt is freaking ghosts with bedhseets over their heads in design. Tombkings are as copyright vulnerable as any other army in the entire range that GW produces. Heck Raging Heroes are making alternate Dark Elves and Deamonettes without any issues what so ever - they also make alternate Imperial Guard (sisters of battle style etc....). The only thing GW might have done to "copyright protect" Tombkings would have been to change their product name to something else like they've changed medusa to melusai and elf to aelf. TK and Brets were dropped, from what I can tell, because their sales record was terrible - basically they weren't shifting models and it would seem there wasn't power in the design team behind them. Ergo there was no great desire from within GW design team to make TK and not enough sales to make management "force" them so it was easier just to drop them. I've even heard rumour that they "forgot" about TK until after everything had gone to print and didn't have "time" to add them back into the game. Suffice to say for whatever reason(s) they were both dropped, though Brets have persisted somewhat in the lore and are now technically returned through the Flesh Eater Courts. There's also the fact that Brets were basically the "cavalry army of good" as their main focus so that could be returned to the game in some form. They might not ride horses, but it could be done. TK were more unique for GW in terms of their style and design, however they had a lot of modern plastic kits that would ideally fit into the epic fantasy setting that is AoS. A few new basic units and a hero unit in plastic and they could very easily be relaunched into the game. sure they wouldn't be called Tomb Kings; their lore might be totally new; but GW could bring the models back and let TK players put them back on the table officially within the current rules of the game. 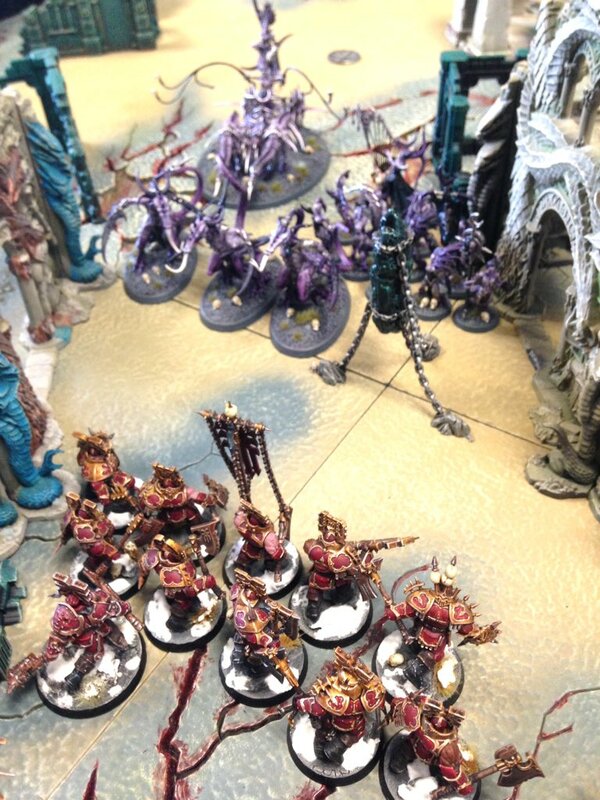 GW are doing a second community survey and I hope many aoS fans are able to unit in asking for GW to bring the TK back as an army in some form. So I came across this, the artist seems to have done other work for GW but to what extent I’m not sure, there seem to be early designs of what we now have as the Archaon model, as well as some other miniatures which have come out in the last few years such as the mounted stormcast. I’don’t know whther they were done inretorspect of the models being released, but if so then this concept art would be odd in that its’s not based ona model. So I came across this, the artist seems to have done other work for GW but to what extent I’m not sure, there seem to be early designs of what we now have the Archaon model, as well as some other miniatures which have some out in the last few years such as the mounted stormcast. I’don’t know whther they were done inretorspect of the models being released, but if so then this concept art would be odd in that its’s not based ona model. This is like... my dream kit xD. Awesome little find, if it's not real then it freaking should be! Particularly fond of the beast. Super sweet! This is really professionally done, if it isn't legit whoever did this should seriously consider applying to GW. If it is real well I can't wait to see the rest of the line because this looks amazing. Whoever did this, looks like a super cool unit. Can't wait to see it disemboweling SCEs by the dozens. If this isn't a leaked concept check somebody please email this to a GW employee, we need this NOW! This is like telling somebody who plays High Elves to play Dark Eldar. They got pointy ears. "Go play a different faction in a different game"
I dunno, that's what every squat player had to do when they died out* and had to move to other factions (*cough cough* Kharadron Overlords *cough cough*). *My understanding of what happened to the original squats is incomplete, forgive me if I am wrong. actually its very likely that 'bretonians' as we know them are coming back, as in an army who's focus is fast shock cavalry. knights are just too popular an image for GW not to make their own version of it. GW even left plenty of options open for it. either as a free people subfaction separate to freeguild (a feudal knights subfaction) or an equivelent to a imperial guard regiment of freeguild (either mainly aethetics like catachans to regular guard, or with actual rules and new units like deathkorps to regular guard). Aditionally we have events in the end times which can easily justifie 'bretonian' faction completely separate from freeguild (louen becomeing a god, plus although we know chaos new of the realm of haven it was never actually stated to have been destroyed and even hinted that it survived). in adition the lady is even mentioned in the lore in AOS (by deranged chaos troops, but still) which could simply be a nod, but it also means that technically bretonians were 100% squated. also they never said that bretonians were too generic (as far as i remember), that is what fans argued to justifie them being squated. however i have heard that GW admitted they actualy squated bretonia by accident (the gies converting empire to freeguild, etc forgot about bretonians). this makes more sence as the bretonian range was just as unique as the empire one. so actually i would argue that 'bretonians' (as in army style not necessarily lore) returning in some form is basically guaranteed, they may even decide to make order draconis into 'bretonian' elves (currently their stuff is too focused on their dragons and not enough on their 'knights' to be a 'bretonian' army). also you can easily argue that with very minor model modifications you can make bretonian models very unique. Additionally I think its very pretentious for ignorant fans to deside what GW can and will do. If GW decided to they could bring back any faction they wanted (and if they were too generic adding just enough to capture the old flavor while adding enough to make it trademarkable). afterall stormcast are basically just generic fantasy buff paladins with relatively minor unique features. If GW feel it will sell they will add it eventually, which combined with both bretonia's internet popularity and the popularity of knights in general, a knightly faction or subfaction with clear references to bretonia, is very likely. even if its a forgeworld army. I don’t think it was chapterhouse that did bretonnia in. it was probably a combination of having an old model line that GW never updated, and lack of popularity. Bro, what are you talkin about? I think you are missing the point of my comment.